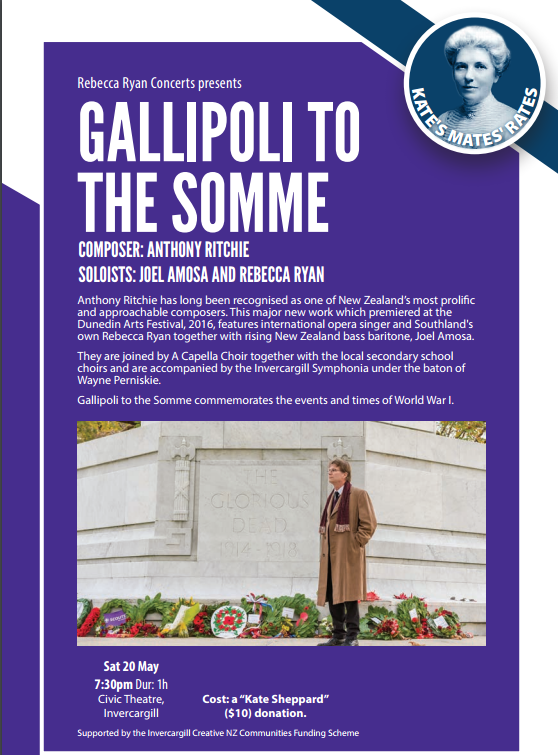 We were delighted to be part of this performance of New Zealand composer Anthony Ritchie's Gallipoli to the Somme, which was performed during the Southland Festival of the Arts 2017. 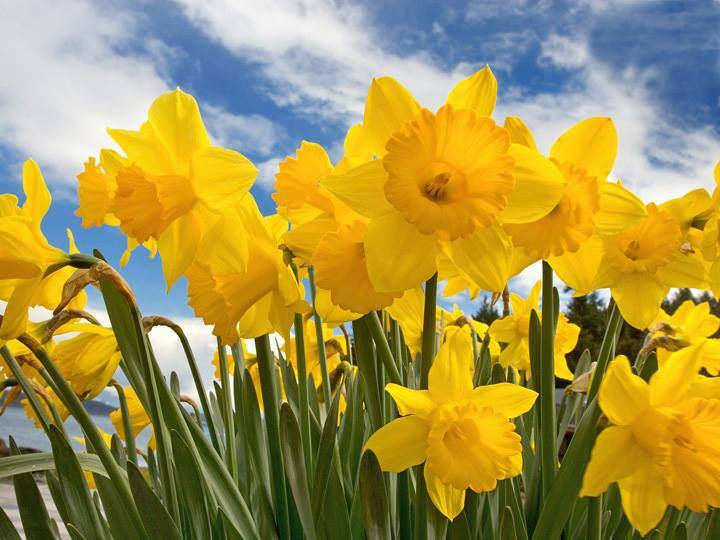 Two short concerts at the Southland Museum, featuring songs relating to the seasons, particularly Spring. Click here for a short video extract of our performance Dido & Aeneas on YouTube. The World Premiere of music from 'Let There Be Joy', music for Advent, Christmas and Epiphany, edited by Dr Raymond White. 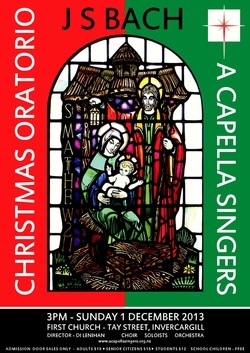 13 songs items performed by the full choir and Concertino, accompanied by a chamber orchestra. 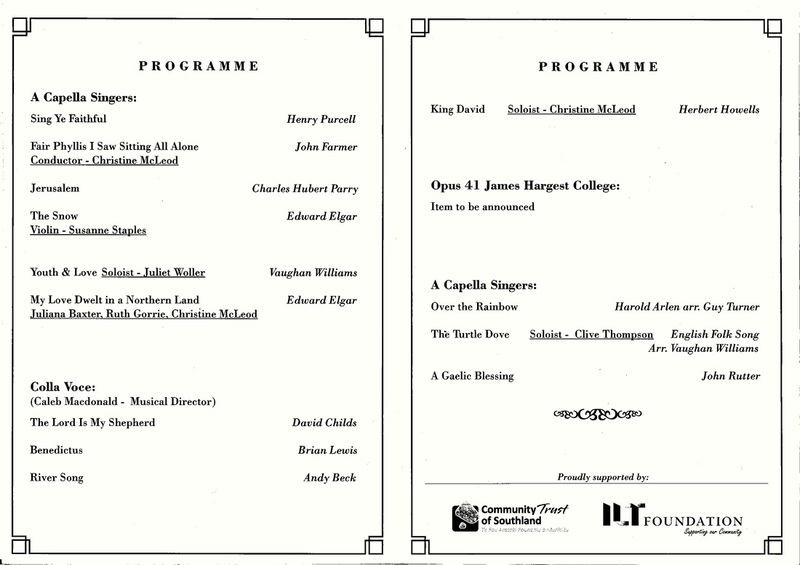 Soloists were Christine McLeod, Juliana Baxter, Clive Thompson & Michael Buick. Conductors - Di Lenihan, Raymond White and Christine McLeod. The choir also sang carols with the congregation invited to participate: Adeste Fidelis, Quem Pastores Laudavere,The Twelve Days of Christmas & Stille Nacht,Heilige Nacht.and Joy to the World. 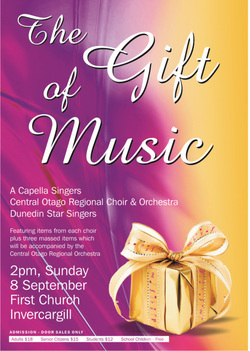 Joint concert with the Central Otago Singers, Dunedin's Star Singers and the Central Otago Orchestra. 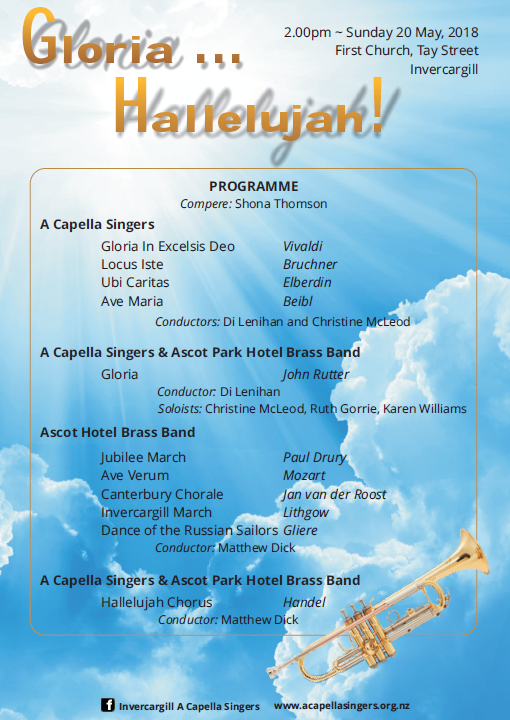 The choir performed works by Handel, including serveral choruses from 'The Messiah' and Zadok the Priest. Rebecca Ryan, recently returned to Invercargill from a successful career overseas sang arias from 'The Messiah' and other Handel arias. Choir members Ruth Gorrie and Christine McLeod sang a duet from 'Alexander's Feast' and the A Capella Concertino performed two traditional Christmas carols. The concert concluded with carols with participation from audience members.